DearWorld.org is a non-profit organization that connects creators and communities to help people learn important things about each other. The organization, founded after Hurricane Katrina in New Orleans, is known for its distinct portrait style, where each person writes the first line of a meaningful story only they can tell on their body. 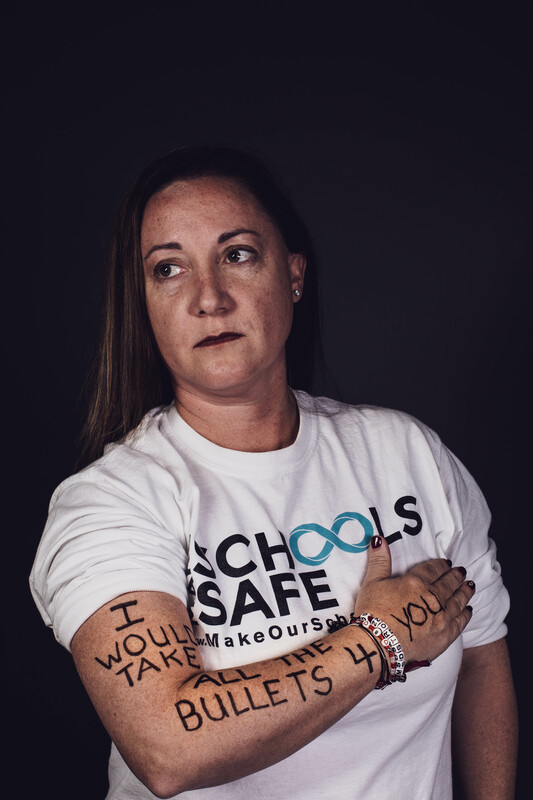 Lori Alhadeff’s portrait and love letter honors her daughter Alyssa Alhadeff, whom she tragically lost in last Valentine’s Day shooting at Marjory Stoneman Douglas High in Parkland, Florida. Lori connected with Dear World through Dave Fortier, founder of the non-profit organization One World Strong and Boston Marathon Bombing survivor. Dear World founder Robert X. Fogarty stayed closed with many of those survivors including Dave Fortier. Lori participated in a workshop with Dear World that One World Strong organized, and began talking with Dave about a Valentine’s Day tribute to honor Alyssa on the one year anniversary of the shooting. This is Lori’s letter to Alyssa. It’s Valentine’s Day. A day full of love, chocolates and flowers. And your soccer team…wow, what a group. They wear your number eight on their sleeves and have starting using it sideways to honor you. Infinity. I ran for the school board. I won! I screamed on national TV—words of rage directed at the President! I started a non-profit called Make Our Schools Safe and there is a law named after you in New Jersey–Alyssa’s Law. Click here to Donate to Make Our Schools Safe in Alyssa’s honor.